As we mentioned in our post Why You Should Stay at a Disney Resort, there are a number of benefits to staying on property at a Disney hotel. From the ambiance, to the convenience, to the extra perks, and the great service. But spending Christmas at Disney resorts is very special during the holiday season, and super convenient! 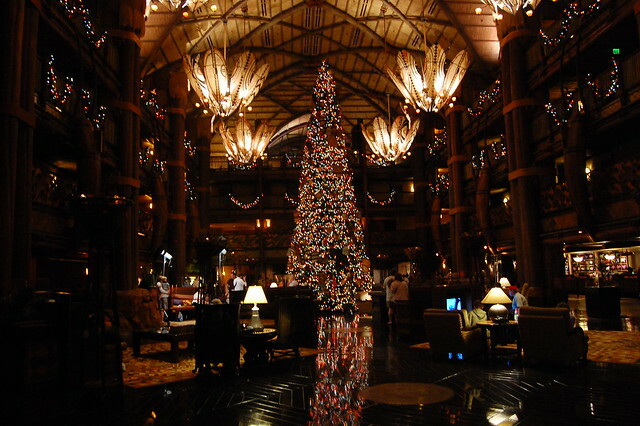 Why Spend Christmas at Disney Resorts? First of all, the décor and ambiance at a Disney resort during the holidays is much more than you will see at other hotels. Enormous Christmas trees fill the lobbies, and garland, tinsel and lights are strewn all across the properties. Holiday music is playing and some resorts will have special holiday-oriented activities or attractions. For example, each year Disney’s Fort Wilderness (a campground / cabin resort) encourages their guests to decorate their campsites. And let’s just say that some people will decorate their areas more than most people decorate their houses! Some campsites are so decked out that they require extra trailers to tow all the decorations. We actually have a lot of fun strolling around Fort Wilderness at night just looking at all the decorations. Since this resort is spread out and many people have golf carts to get around, they also have a golf cart decoration contest and a parade of golf carts that go around the resort periodically. Even if you are a spectator, it is enjoyable to see so many families having fun together! This is a decorated campsite for Christmas at Disney’s Fort Wilderness Resort. One of many to explore at night! At the Grand Floridian Resort they have a unique attraction, a larger than life ginger bread house! This enormous house is a huge presence in the lobby, and is made of completely edible materials. Made fresh each year, the skill and attention to detail is something to be admired. Plus, the whole lobby of the hotel smells like freshly baked gingerbread. After you’ve admired the house, you can even purchase fresh gingerbread from the shop inside the house! The homemade gingerbread house at the Grand Floridian Resort – Christmas at Disney! Stay Close to the Disney Holiday Action, and Stay Late at the Parks! Disney World (and all of central Florida) can get very crowded during the holiday season. So it is even more convenient when you have a hotel that is located so close to the action. If you stay at a Disney resort, then you can opt to take the Disney transportation system so that you can bypass some of the traffic and parking congestion. Another reason to stay there is that it is convenient to return to your hotel for a break in the day, if there are a lot of crowds at the parks. Christmas decorations fill the parks and resorts over the holiday season. Lastly, staying at a Disney resort gives you “Extra Magic Hours” perks where you can enter the parks early or stay late. This is HUGELY beneficial during the holidays when the parks can be crowded. You can relax at the resort and then go the park later when there is no one there! In fact, on days when the Magic Kingdom Park is forecast to have large crowds, they may even stay open to 3 am or beyond! Yes, 3 am!!! So go ahead and relax at your hotel during the day and come back at night. I promise you, if you stay until 3 am you will get the chance to ride all the rides you want to with minimal wait times. So it’s definitely a WIN! Christmas fireworks at Disney are some of the best fireworks you will ever see! Spending Christmas at Disney Resorts is Well Worth Every Penny! Staying at a Disney resort during the holidays is an experience that you and your family will cherish for years to come. In fact, you might get hooked and decide to visit every year. We know of a number of families that have made it a tradition to visit Disney every year for Christmas! And for us, a year that goes by when we don’t have a trip to Disney during the Christmas season feels a bit strange. Spending Christmas at Disney is a wonderful family memory.